Hope all the visitors in town for the Fair and Rodeo enjoy the weekend. Lots of different events taking place. Kiowa County Fair & Rodeo may not be considered 'The Granddaddy of them all' but it is a good time for all involved. USDA Farm Service Agency (FSA) has announced that farmers and ranchers in Colorado now can receive notifications from their county office through text messages on their cell phone. Whether producers are in the field, on a tractor or even on horseback, this service enables FSA customers and stakeholders to receive notifications while on the go. Producers will receive text messages regarding important program deadlines, reporting requirements, outreach events and updates. Producers can text COKIOWA to FSANOW (372-669) to subscribe to text message alerts from Kiowa County. Standard text messaging rates apply. Contact your wireless carrier for details associated with your particular data plan. Participants may unsubscribe at any time. Please contact your local FSA office at 719-438-5851 ext. 2 if you have questions regarding FSA's email news service or the new text message option. The Agricultural Act of 2014 authorized 2014-2018 crop year Marketing Assistance Loans (MALs) and Loan Deficiency Payments (LDPs), with a few minor policy changes. Among the changes, farm-stored MAL collateral transferred to warehouse storage will retain the original loan rate, be allowed to transfer only the outstanding farm-stored quantity with no additional quantity allowed and will no longer require producers to have a paid for measurement service when moving or commingling loan collateral. MALs and LDPs provide financing and marketing assistance for wheat, feed grains, soybeans, and other oilseeds, pulse crops, rice, peanuts, cotton, wool and honey. MALs provide producers interim financing after harvest to help them meet cash flow needs without having to sell their commodities when market prices are typically at harvest-time lows. A producer who is eligible to obtain a loan, but agrees to forgo the loan, may obtain an LDP if such a payment is available. Marketing loan provisions and LDPs are not available for sugar and extra-long staple cotton. FSA is now accepting requests for 2017 MALs and LDPs for all eligible commodities after harvest. Requests for loans and LDPs shall be made on or before the final availability date for the respective commodities. Before MAL repayments with a market loan gain or LDP disbursements can be made, producers must meet the requirements of actively engaged in farming, cash rent tenant and member contribution. Commodity certificates are available to loan holders who have outstanding nonrecourse loans for wheat, upland cotton, rice, feed grains, soybeans and designated minor oilseeds. These certificates can be purchased at the posted county price (or adjusted world price or national posted price) for the quantity of commodity under loan, and must be immediately exchanged for the collateral, satisfying the loan. MAL's redeemed with commodity certificates are not subject to the actively engaged in farming, cash-rent tenant, Adjusted Gross Income provisions or the payment limitation. To be considered eligible for an LDP, producers must have form CCC-633EZ, Page 1 on file at their local FSA Office before losing beneficial interest in the crop. Pages 2, 3 or 4 of the form must be submitted when payment is requested. The 2014 Farm Bill also establishes payment limitations per individual or entity not to exceed $125,000 annually on certain commodities for the following program benefits: price loss coverage payments, agriculture risk coverage payments, marketing loan gains (MLGs) and LDPs. These payment limitations do not apply to MAL loan disbursements or redemptions using commodity certificate exchange. Adjusted Gross Income (AGI) provisions were modified by the 2014 Farm Bill, which states that a producer whose total applicable three-year average AGI exceeds $900,000 is not eligible to receive an MLG or LDP. Producers must have a valid CCC-941 on file to earn a market gain of LDP. The AGI does not apply to MALs redeemed with commodity certificate exchange. 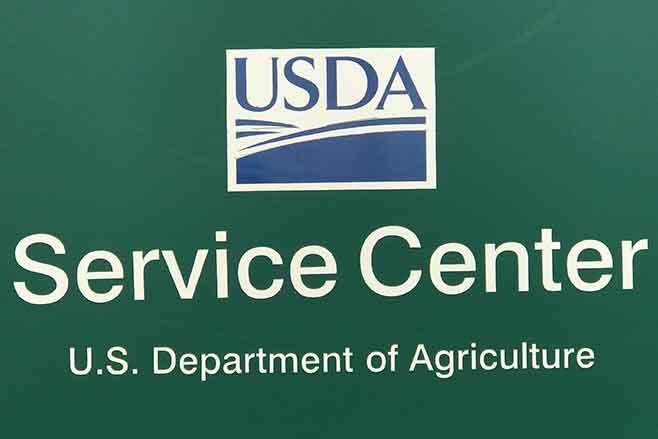 For more information and additional eligibility requirements, please visit a nearby USDA Service Center or FSA's website www.fsa.usda.gov. If loan grain has been disposed of through feeding, selling or any other form of disposal without prior written authorization from the county office staff, it is considered unauthorized disposition. The financial penalties for unauthorized dispositions are severe and a producer's name will be placed on a loan violation list for a two-year period. Always call before you haul any grain under loan. The past week's posted county price review. Be reminded, for an effective LDP rate, the effective Posted County Price (PCP) must below the loan rate of $2.84. Producers with 2016 outstanding marketing loans need to be aware of the posted county price for 2016. The 2016 loan rate for wheat in Kiowa County was $3.03 and producers have an outstanding marketing loan, they can repay that loan at below loan rate if the posted county price is below $3.03 on that day of repayment. Producers can also 'lock in' a repayment rate anytime 14 days prior to loan maturity. The option to repay at a lesser rate than the loan rate is valid up to day of maturity, but repayment must be immediate. Loan Deficiency Payments (LDP) for 2016 can no longer be requested.